Although we're only seven sessions into the month, the top penny stocks for February 2017 have seen tremendous gains. In fact, the biggest gainer has already soared 136.4% since Feb. 1. 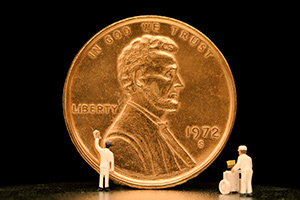 That's why we're going to show you the five best-performing penny stocks of the month so far. And as a bonus for readers today, Money Morning Chief Research Analyst Sid Riggs just recommended one of the best penny stocks to buy right now. This company just crushed its latest Q4 earnings report, beating analysts' prediction by 86%. But remember, the first list of five top penny stock gainers are not recommendations. While these stocks have seen double- and triple-digit gains, most of them aren't good additions to your portfolio. Investing in penny stocks requires plenty of due diligence, including thorough research of the company's finances. Top Penny Stocks for February 2017 No. 5: MYOS RENS Technology Inc.
MYOS RENS Technology Inc. (Nasdaq: MYOS) is a company that develops nutritional supplements geared toward managing degenerative muscle diseases. Some of the targeted diseases include scarcopenia and cachexia. MYOS RENS' most popular product is Fortetropin, a powdered workout supplement that retails between $30 and $70. The MYOS stock price has surged 44.4% to $4.03 so far this month. Shares are also up a massive 175% since February 2016. Top Penny Stocks for February 2017 No. 4: Cerulean Pharma Inc.
Cerulean Pharma Inc. (Nasdaq: CERU) is a biotech that targets various types of cancer. Its signature Dynamic Tumor Targeting employs what are known as NDCs, which attack tumor cells directly without harming surrounding healthy tissue. Cerulean's lead candidate, CRLX101, is currently in clinical trials and will specifically treat ovarian cancer. Shares of CERU stock have gained 53.1% from $0.81 to $1.33 per share since the start of the month. However, the stock is down 40.3% over the last year. Top Penny Stocks for February 2017 No. 3: Benitec Biopharma Ltd.
Benitec Biopharma Ltd. (Nasdaq ADR: BNTC) is an Australia-based firm making and testing treatments for long-term illnesses. The treatments target hepatitis B and age-related macular degeneration (AMD), among several other diseases. The BNTC stock price soared 121% on Thursday, Feb. 2, after the company said it's making progress advancing its ocular therapy. Since Feb. 1, shares have climbed 74.4% to $3. However, Benitec stock has dropped 16% since February 2016. Top Penny Stocks for February 2017 No. 2: Acura Pharmaceuticals Inc.
Acura Pharmaceuticals Inc. (Nasdaq: ACUR) develops products meant to reduce abuse of certain prescription medications. One of the company's medicines, Aversion, uses active pharmaceutical ingredients to discourage and curb opioid abuse. Another product, Impede, is used to reduce the abuse of pseudoephedrine (PSE), a common ingredient in cold medicines. Acura stock is up 88.9% to $1.02 since Feb. 1. But the ACUR stock price has plunged 53.4% in the last 12 months. Top Penny Stocks for February 2017 No. 1: Naked Brand Group Inc.
Naked Brand Group Inc. (Nasdaq: NAKD) sells clothing and apparel for both men and women. Specifically, the New York-based company retails sleepwear, underwear, and loungewear. On Feb. 2, the NAKD stock price skyrocketed 138% after the firm said it was launching a new clothing line called "Comfortably You," which includes women's loungewear and sleepwear. The stock is up 136.4% to $2.86 in February. Naked stock is up 11.7% since February 2016. While we don't recommend investing in those five penny stocks, we do recommend considering Riggs' latest pick. Riggs – an expert at identifying massive profit potential in the small-cap sector – likes this company because it provides products for several key industries. Riggs' favorite penny stock investment right now is Intevac Inc. (Nasdaq: IVAC). Shares of IVAC are up 10.2% over the last month and currently trade at $9.48. Although that price is technically above the penny stock cutoff of $5 a share, the company's presence in several growing markets makes it worth the four extra bucks. You see, Intevac is a semiconductor company that supplies sensor technology used in thin-film equipment. This kind of equipment is used in many different industries, including defense, solar, and digital media. For example, Intevac's sensors can be found in night-vision technology used by the military. They can also be found in solar panels installed on rooftops and cameras used for standard photography. Intevac has plenty of growth potential because it's tapped into these booming industries. GTM Research projects 410 megawatts of community solar will be installed by the end of 2017 – up 88.1% from 218 megawatts in 2016. And Deloitte reports that revenue from defense subsectors are expected to grow 3.2% this year. But Riggs also likes Intevac stock because it shocked analysts in its latest earnings report. The company earned $0.13 per share in Q4 2016, which surpassed three Zacks Investment Research analysts' expectation of $0.07. Those earnings per share also marked a huge 208% increase from Q4 2015, which saw a loss of $0.12 per share. With rising earnings and a strong presence in several growing industries, IVAC is a more expensive penny stock for strong reasons. It's the rare small-cap company that's poised for long-term success. I'm finding it difficult to buy n sell penny stocks. I'm based in Canada. Any suggestions ? Why the heck would you find it difficult to buy penny stocks in Canada. Just open an account at Questrade. Occasionally there is a rare stock that for some reason they don't let you buy (like CBIS) but that hardly ever happens. They say its a government restriction and not their fault.